A three-day meeting began on to highlight the importance of early childhood on overall human development. The physical, psychological and mental makeup of an individual has been shown to largely be based upon the first eight years of life. Policies and strategies based on the Integrated Early Childhood Development (IECD) approach are being debated by service providers throughout the Kingdom. 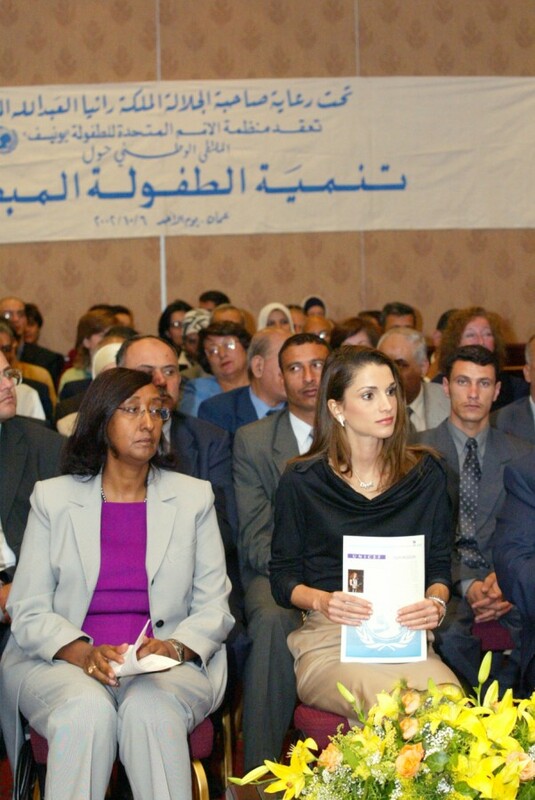 The meeting, patronised by Her Majesty Queen Rania and held through the joint efforts of UNICEF and John's Hopkins University, was attended by Prince Raad, and brought together representatives from ministries of awqaf and Islamic affairs, education, health and social development, as well as UNRWA and various NGOs. Experts are expected to develop an action plan integrating the many services extended to families and children, UNICEF's Children's Rights Project officer Maha Humsi told The Jordan Times. Care for children's growth and development was particularly emphasised by UNICEF's Better Parenting Project — one of the essential components of IECD launched in the Kingdom in 1994. The project aims to ensure children's rights within the family, seen as the primary determiner of a child's well-being. The project has been implemented in over 100 centres, reaching more than 16,000 participants. "IECD policies seek to strengthen a family's ability to care for children," explained UNICEF representative Misrak Elias, adding that the approach must respond to critical issues such as gender equality, the rights and status of women, and the safety of a young child's physical environment. She continued, saying the challenges currently faced need to be tackled to ensure the best care for children. One challenge is sustaining the cross-sectoral partnership between the IECD and the 13 governmental and non-governmental agencies. To meet the challenge, UNICEF recently signed an agreement with the Ministry of Awqaf to address men during Friday prayers as an effort to convince them that both parents are responsible for a child's upbringing, said Elias. The Ministry of Education is another party playing a significant role in the development of children. Minister Khalid Touqan briefed participants on some of the ministry's achievements. In 1994, kindergarten education was made part of primary schooling, but was not made compulsory. By 2005, the ministry intends to increase the number of children enrolled in kindergarten from 28.5 per cent to 35 per cent by an expansion of public KG's in remote areas. Thus far, 160 new KG classes have been added to public schools, said Touqan. Investments in early childhood bear fruit in the future, said UNICEF, adding, that for every dollar spent there is seven-fold return, improving the country's position in the global economy. "Investing in young children will bring long-term social change and the sustained realisation of children's rights," said Elias.